The students and staff of Whitman Elementary School honored more than 60 local veterans on Monday, Nov. 6, with a celebration featuring patriotic songs, student-written letters of thanks and the presentation of colors by the Washington Township High School Color Guard. 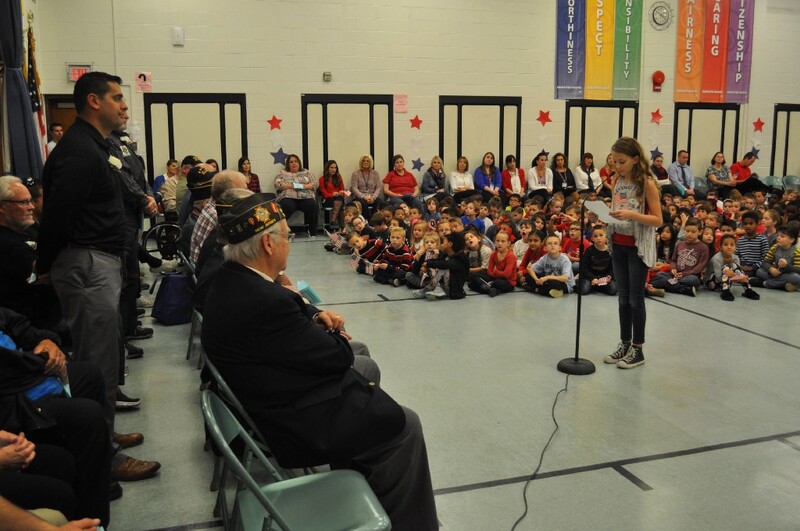 Pictured is Whitman Elementary School fifth grader Chloe Argentini reading aloud her letter to the servicemen and servicewomen of the U.S. Marine Corps. Residents voted in the 2017 General Election this week to determine who would fill the three open seats of the Washington Township Board of Education, while the community had the opportunity to speak on the future of the district at a Strategic Planning Community Meeting. 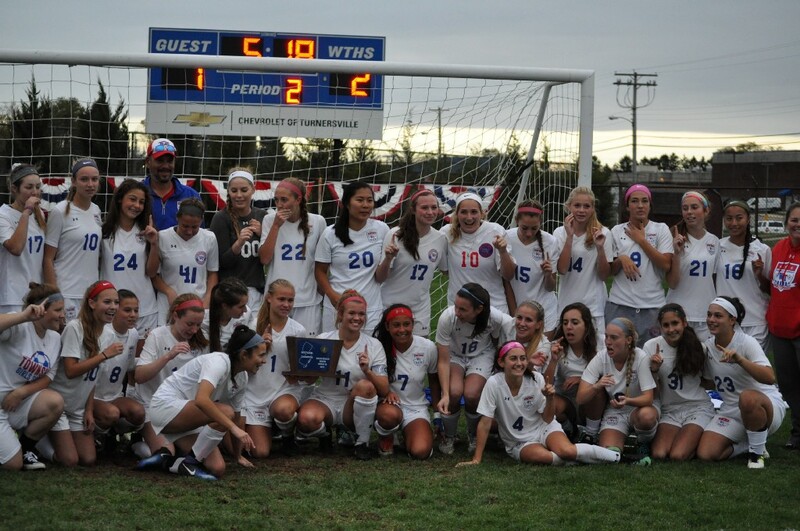 Also, the Washington Township High School girls soccer team won their first state title in the South Jersey Group 4 Championship against Toms River North High School, and council voted on zoning and holiday community outreach programs. Check out some of the top stories from the past week in the Weekly Roundup. Washington Township voters cast their ballots in the General Election on Tuesday, Nov. 7. Incumbents Ginny Murphy and Julie Yankanich will be joined by newcomer Raymond Dinvoi Jr. to fill the three, three-year terms on the Washington Township Public School District Board of Education. According to the Gloucester County Board of Elections’ unofficial results, Murphy received 6,588 votes, Yankanich 5,665 votes, and Dinovi 5,017, finishing ahead in the race against challengers Thomas Gleason, with 4,555 votes, and Dominick Ruggiero Jr., with 4,588 votes. Washington Township High School girls soccer made history last week when they won their first title, 2–1, in second overtime against Toms River North High School at the South Jersey Group 4 Championship on Thursday, Nov. 9. With a young team on the field and numerous injuries throughout the season, the team remained focused on their goal from the start of the season. Washington Township will move on to the NJSIAA Group 4 state semifinals against Central Jersey Group 4 champion Freehold Township on Tuesday, Nov. 14 at 5 p.m. at Rowan University. Zone changes and community events were topics of discussion at last week’s council meeting. Council voted to pass two separate ordinances that would change zoning on Chapel Heights Road and Route 42, as well as approved a resolution to authorize the Washington Township Police Department “Shop with a Cop” program. Members of the Washington Township community had the opportunity for their voices to be heard at the public school district Strategic Planning community focus group on Nov. 9. Attendees were able to share their vision for how they wish to see the district grow and develop, in all facets of education, over the next five years. Community members, with or without children, who wish to participate in the strategic planning process are encouraged to take the online survey found on the district website. For more information, visit www.wtps.org.